After two exhausting days of bottling this week, our warehouse is filling up. We now have 8 pallets of 2007 Cabernet Sauvignon and 5 pallets of 2007 Merlot. Our good friend Jimmy Jenkins at Fort Worth Screen Printing dropped by to check out the organized chaos. Using his handy dandy iPhone, he put together a great little video of the bottling process. You can also see Andrew's OSHA stretches on our Facebook page- always a good laugh. Oh! And we're always looking for volunteers for our next bottling! I am so pleased to announce that we have finally started production here at Times Ten Fort Worth! We brought in 2007 Cabernet Sauvignon and 2007 Merlot from California. Before any juice could touch our tanks, we had to scrub the inside of the tanks to ensure that they were free of anything detrimental to the wine. 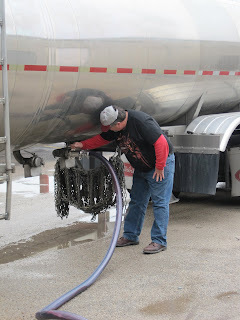 Bill, who helps Chris out in our cellar, did a great job getting those tanks squeaky clean. 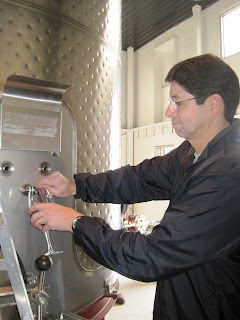 Dustin and I arrived early to sanitize the hoses so that everything that the wine came in contact with was safe. A huge tanker truck rolled up and had to squeeze down our back alley. It was pretty interesting to see a semi fit between freshly laid cement and a tree. Fortunately, he made it- thanks to years of experience. We hooked up our hoses and let the wine flow! Opening up the valve. Yay wine! 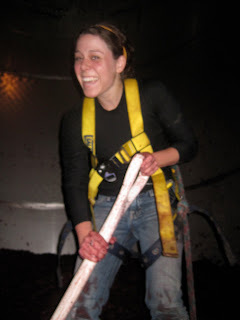 The fun part of wine making. Cleaning! After everything was pumped into the tanks it was time to clean up. I showed off my squeegee skills that I picked up at Benton-Lane. Bottling commences next week. It's hard labour, but good times are always had. Well, Harvest 2009 is long over and I have been remiss to write a wrap up post. So, at last I will finish the story of my time in Oregon. 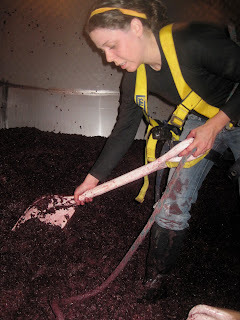 The last couple of weeks were spent pressing the red wine and digging out tanks. All of the juice goes straight to a juice pan, but there is plenty left in the tank. Someone has to jump in the man-door and scoop out with a food grade shovel all the skins and seeds. Oh, and you're being timed. You have to wear a harness with a rope attached in case you pass out from CO2 overexposure, they can pull you out. But, it shouldn't ever get to that point, as you are wearing a CO2 monitor on your chest and the top is being ventilated by a fan, pulling the carbon dioxide out of the tank. I jumped in and scooped out one of the juiciest tanks there were- lucky me. See me up to my knees in grapes below! Once everything in the tank has been pressed, a hose is hooked up to a pump, which is in turn hooked up to the barrel filler. Armed with a flashlight and a keen eye for precision, each barrel is filled to the maximum capacity, allowing a little room for stirring. Each barrel gets a thorough scrubbing with hot water (or cold if it is a brand new barrel) using the pressure washer hooked up to a handy-dandy barrel cleaner attachment. They have tools for everything! 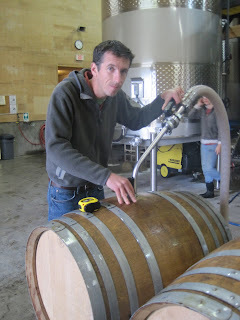 Once the barrel is sparkling clean and dry, they are rolled over to be facing exactly upright and exactly in line. Once, stacked 12, 14, 20 high, the stack will lean if this is not spot on. It would take me an hour just to do a few rows. Tedious, yes. Fun, no. Now that everything had been barreled down there was little to nothing left for us interns to do. So, the number dwindled down to three. My dear friends Callista, AC, and Kim. They cleaned up, organized, and stored everything away for next year's cellar rats. And I heard from a reliable source, Kim, that First Class 2008 was bottled just a few weeks ago. Can't wait to taste that out of the bottle- it was phenomenal in the barrel! I will send out a post when 2009 is released so you can purchase some of my hard work! It was a great year for Willamette Valley and knowing the people I worked with, it will be one stellar wine.